St. Joseph Catholic Church is a symmetrical, weatherboard sided Gothic design, with an eight-sided spire, parapets, and a square louvered lantern in the tower. 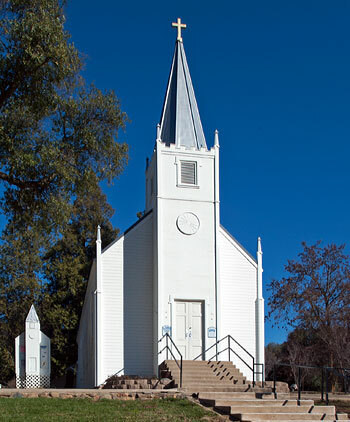 The church is reported to have been built of sugarpine in 1862. The church bell was cast in 1862 and is still in use. Adjacent to St. Joseph Catholic Church is the Rectory. The two-story rectory embodies the architectural elements of the Craftsman/Bungalow style, reflective of Mariposa's eclectic mix of architectural styles. The Catholic Cemetery is located directly behind St. Joseph Catholic Church and Rectory. Internment began in the 1860s and continues to the present, although most of the plots date from the nineteenth century. Headstones are made of marble and native stone, with motifs typical of the mid to late nineteenth century. Many plots are surrounded by decorative iron fencing. Excerpted from the 1991 NRHP nomination form.